Welcome to Le Petit Chat and to our charming Medieval Abbey town, Beaulieu sur Dordogne. By many claimed to be the most beautiful town in the upper Dordogne valley. 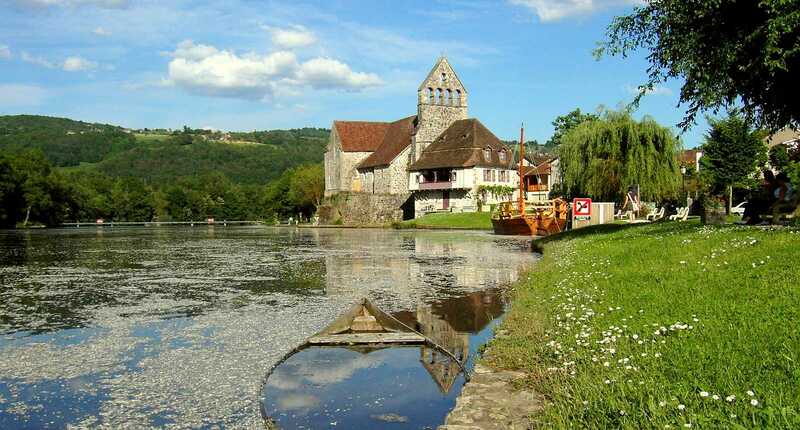 Beaulieu is situated in the middle of France, in the department of Correze, alongside the Dordogne River and is a pulsating medieval town surrounded by charming little villages. The area is ideal for an active holiday with activities like bicycling, walking, swimming, canoing, golf and horseback riding. It is an ideal spot to use a base for further away, like Rocomandour (30 minute drive) Cahors (2 hour drive), Sarlat de Caneda (2 hour drive), the wine areas of both Cahors and Bergerac (easy day trips). We can also offer a two bedroom self-contained apartment for weekly rent. The flat is also available for long-term let outside the main tourist season by special arrangements. We ask for checkin after 4:30 pm and check-out lattest at 11:00 am. We accept small animals but contact us in advance please. We speak English, French, German and Norwegian. All our rooms are spacious, and have king size beds. All the rooms have space for an extra bed. Our prices range from €37 in the low season to €48 in the high season for 1 person, and from 50€ à 58€ for two, extra bed is 15€, including breakfast and tourist tax. With stonewalls and wooden beams, and an old wooden floor Large bathroom with shower and blue tiles. The view is stunning with the hilly countryside and the Dordogne. One bedrooms with a king size bed, 2 single beds in the living room. Living room, bathroom with shower/toilet and a kitchen with a microwave, oven and dishwasher. We serve a French breakfast, with a twist. We charge a 20% deposit at the time of your booking. We accept French checks, International money orders, cash or direct payment to French or Norwegian bank accounts. If you have not been to the region, you can roughly say that Beaulieu sur Dordogne lies in the middle of France. If you are familiar with the Dordogne region, the Department of Correze is just a bit further up-river. Beaulieu has many interesting sites close by, and is an easy daytrip away from the wine areas of both Cahors and Bergerac. Swimming, canoeing, golf, horse riding and tennis – all within a short distance from Beaulieu. If you decide to visit during the winter, the skis lopes of Massive Central are only a couple of hours away. 19, rue de la chapelle, 19120, Beaulieu sur Dordogne, France. For more informations about Le Petit Chat, please complet this form. If you have any special enquiries, you can contact us and we will try to help you. Copyright © 2019 Le Petit Chat. Proudly powered by WordPress.